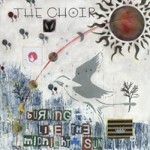 CD Review: The Choir, "Burning Like the Midnight Sun"
I’ve been a supporter of the group The Choir for a long time. In fact, one of my first contributions to Popdose was an appreciation of the band. They’ve collectively seen every up and down that could ever be, both personally and as a musical entity. Their output has been marginalized due to the quirks and classifications of music industry biases and shenanigans. That they are still recording at all is some kind of miracle. That they should record something as solid and worthy of praise as Burning Like The Midnight Sun at this stage is no miracle at all. It’s just something we’ve taken for granted. Almost every track of the album is a deeply personal tribute to someone in their circle, written with candor and sincerity in equal measure as only Steve Hindalong can. The most affecting of these are “That Melancholy Ghost” and “A Friend So Kind”. The former recounts Hindalong’s daughter, going through the pains of her first real broken heart situation. The latter is a recollection of their friend, musician Tom Howard, who died suddenly this year. It is not an album solely of wounds needing to be licked. The funny, yet rather deadpan “Mr. Chandler” is about bassist Tim Chandler’s frustrating bout with an airline while the band was touring. The opening “Midnight Sun” does something a rock album is expected to do, and that is to rock. Derri Daugherty’s vocals and distorted guitar sound as sharp and slashing as it did back on Kissers And Killers, but he never takes it so far that the pop elements get obliterated. The most telling of the tracks is the closing “Say Goodbye To Neverland” which works on a variety of levels; the first is the story of Peter Pan where Neverland is the world where the Lost Boys never grow up, and rejecting the deceptive comforts of our youths is something we’ve all had to come to grips with in the past few decades. The second allusion is that, at one time, Hindalong and Daugherty ran a recording studio named Neverland. Depending on how much you know about the group, or whether you know nothing at all about them, the song still offers meaning and provides a thought-provoking coda to the disc. Burning Like The Midnight Sun defies expectations and proves that there is no “hill” for a band to be over if they still have a passion for what they do. Order Burning Like The Midnight Sun directly from the band’s site or download from iTunes.